Some pictures are worth a thousand words - and so are some infographics. The visualized data on Ukraine's law enforcement that many Ukrainian Facebook users have been sharing this month tells us that the country's police force is a bit too numerous and has been receiving more and more state funding over the past few years. 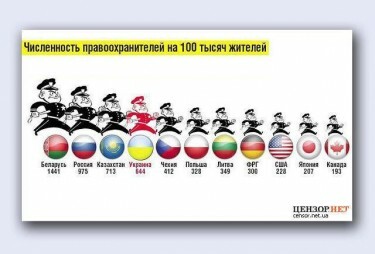 According to the first infographic, which has been shared by 1,160 Facebook users, Ukraine has 644 police officers per 100,000 people. Ahead of Ukraine are Belarus with 1,441 police officers, Russia with 975, and Kazakhstan with 713. Canada ranks the last, with only 193 police officers per 100,000 of its citizens. Below are some of the most typical responses from Facebook users. The regime is so scared of its citizens. Very telling. Looks like the first four countries can easily succeed in creating not [the Customs Union], but the Police Union! Everything is ready!!! One of the possible ways of interpreting the notion of job creation. The next infographic looks at the funding of Ukraine's Prosecutor General Office, the Ministry of the Interior, and the Security Service. 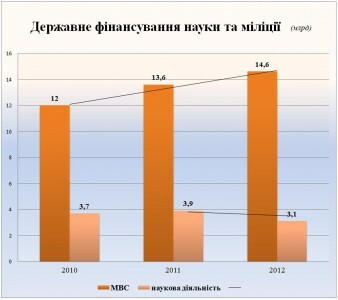 The agency responsible for policing (the figure in the middle) got 15 billion hryvnias for 2013 (approx. $1.8 billion), which is 3.2 billion hryvnias (nearly $400 million) more than it received in 2010. Victor Yanukovych's Police State: how funding for law enforcement agencies has been growing in 2010-2013, in billions of hryvnias. The third graph, which was shared 402 times on Facebook, shows that science, with its 3.1 billion hryvnias (approx. $100 million) from the state budget in 2012, isn't a priority in Ukraine - unlike the police, which got nearly five times that amount last year. The level of funding of science shows the Ukrainian government's colonial nature. We'll get the dinosaurs: strong, aggressive, and with pea-sized brains. In 2010, 780,000 people became victims of police violence, and, according to official records, 50 people died in police custody that year.